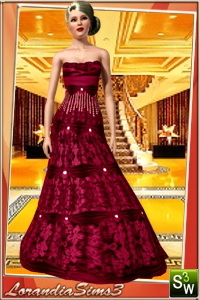 Mermaid gown featuring a rhinestone corset top, for your sims 3 female evening wardrobe. 3 color variations, 2 recolorable areas. 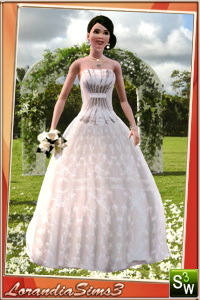 Wedding dress for your sims 3 female. 2 recolorable areas, 3 color variations in the same pack, custom thumbnails, custom bump and mesh. Asymmetrical gown featuring silk and mesh fabrics, tie back and zipper closure. 2 recolorable areas, 3 color variations, custom CAS and launcher thumbnails.